winning streak on the line against two of the Atlantic Division's best. They'll need to do it without Evgeni Malkin, who is staying in Pittsburgh with a lower body injury. Eric Fehr also will be out of the lineup after suffering a "significant" injury Tuesday night against Ottawa. It's bad timing as they'll take on a red hot Tampa Bay Lightning team tonight that has gone on a 9-1-0 tear in their last 10 games. This is the second meeting of the season between the two teams. Tampa won the first game 5-4 in OT as Vladislav Namestnikov netted a hat trick for the Lightning, including the game winner in overtime. 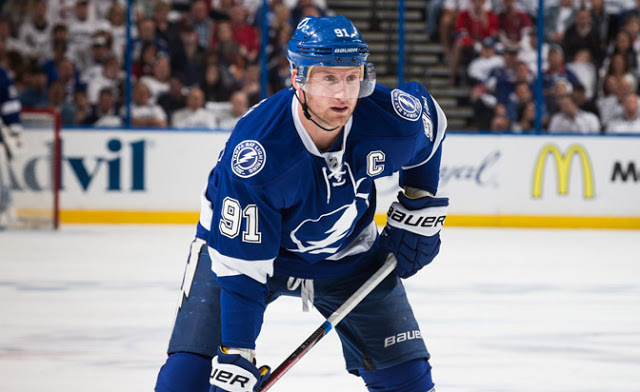 On the Tampa side, it's been a rough year for Steven Stamkos. The Atlantic Division All Star enters tonight on pace to finish with 34 goals, 28 assists, and 62 points on the year for what would be the lowest offensive output since his rookie season. It's entirely plausible that his upcoming free agency and the uncertainty of his future are contributing to his off year, but it's unlikely to turn teams off from the superstar center. And it's becoming likelier as the season has progressed that teams will be able to bid on Stamkos - it's become common knowledge that Stamkos hasn't gotten along with head coach Jon Cooper, and that he prefers to play center instead of wing where he currently lines up. Also, the Lightning appear to be playing hardball with Stamkos. The team has reportedly offered an 8 year deal worth $8.5 million AAV in what would be a severe underpayment for a player who realistically could have the top cap hit in the league next season. Stamkos isn't the only one Lightning GM Steve Yzerman is taking a tough approach with. Jonathan Drouin is another player that hasn't gotten along with Cooper, and while he doesn't have the leverage of a player like Stamkos he certainly has been much more bold and aggressive in trying to force Tampa's hand. After revealing that he had requested a trade upon being demoted to Tampa Bay's AHL affiliate, Drouin and his agent up the stakes further by skipping a January 20th game and forcing Yzerman to suspend him indefinitely. It's a move that won't likely prevent teams from trading for the 2013 3rd overall pick, but it's a move that made potential trade partners take a step back and appears to have thrown a wrench in some prospective deals that were in the works. Even Tampa Bay's "Triplet" line that had so much success last year has failed to provide an encore performance. While Nikita Kucherov leads the Lightning with 21 goals and 43 points, both Tyler Johnson (6g 11a in 37GP) and Ondrej Palat (4g 10a in 30GP) have taken significant step back in production from last season. It's certainly not all bad news for the Tampa Bay Lightning as Ben Bishop made the All Star Game in net for the Atlantic Division. He's taken a big step back towards his Vezina-winning form this year after a disappointing 2014-15 campaign, posting a 0.927 SV% and 1.99 GAA with 2 shutouts in 38 appearances. Victor Hedman is also solidifying his place as an elite defenseman in the NHL. The 25 year old has 4 goals and 25 assists and has been a monster in the possession game, posting a 56.4 CF% (49.4 (TMCF%) in even strength situations. And it's been an unusually strong performance in their own zone that has the Lightning in currently sitting with the 3rd most points in the Eastern Conference. A year after leading the league in scoring, Tampa Bay has a higher GA/gm rank (6th) than they do GF/gm (15th). It's a bit of an anomaly for the Lightning, and if it holds up it'll be the first time since 2002-03 since Tampa had ranked higher in goals prevented than it did in goals scored. - Sidney Crosby enters the game tonight with 898 career points in 675 games. He's in a position to become the fastest active player and 10th fastest all time to 900 career points, marks that are currently held by Jaromir Jagr (681) and Marcel Dionne (678), respectively. Given his longevity, Jagr scored his 900 points in a much different era. Putting things into perspective, the 2nd fastest active player to 900 points is Alexander Ovechkin, who accomplished the feat earlier this season in his 765th game. - The powerplay has been on fire under Mike Sullivan, and after ranking near the bottom of the league under Johnston it's already up to 8th in the league, converting on 20.5% of its opportunities. This included the recent 4 game win streak where the Pens have scored at least one PP goal in every game, going 6-of-16 (37.5%) during that time frame. - Oskar Sundqvist has been recalled from Wilkes-Barre and will be looking to make his NHL debut tonight as the injuries to Malkin, Fehr, and Bonino have created an opening at center. Sundqvist has 5 goals, 11 assists, and 16 points in 39 GP for the Baby Penguins. - A combination of injuries, the Dupuis retirement, and reassigning Daniel Sprong back to the QMJHL means the Pens will face the Lightning with a projected bottom 6 featuring all players who started the season playing for Wilkes-Barre in the AHL.